This article describes the journey of Arjuna from Indraprastha as part of the military campaign for the Rajasuya of king Yudhisthira. Arjuna led his military expedition to the northern territories. This article is part of a series of articles related to narrations of journeys mentioned in Mahabharata. These travel narratives are extremely important for researchers who study about the ancient geography that existed during the period of Mahabharata. Before reading this article, readers are advised to read the main article Arjuna's Military Campaign for Rajasua, that describes the entire journey of Arjuna for his military campaigns to the territories that lied to the north of Indraprastha. This article describes Arjuna's military campaigns in the territories that lied in the Ngari_Prefecture of Tibet along the banks of Sindhu (Indus) and Satadru] (Sutluj) rivers. King Yudhisthira wanted to perform the greatest of all sacrifices viz. the Rajasuya sacrifice. This involved military activity along with the usual sacrificial rites. The king's armies would march under his appointed military generals in four cardinal directions and defeat all the kingdoms encountered in their paths. Any kingdom can chose to accept the sway of the king peacefully or choose to battle against the king's military general. King Yudhisthira obtained a huge army by defeating the rising Magadha empire of king Jarasandha as Bhima slew Jarasandha in a dual of mace-fight. Taking a portion each of that army, the four brothers of king Yudhisthira, viz. Bhima, Arjuna, Nakula and Sahadeva marched from Indraprastha to the four cardinal directions. Arjuna was responsible for the military expedition towards the northern direction. Arjuna subdued Bhagadatta in Pragjyotisha (see Arjuna in Pragjyotisha) through peaceful means and extracted tribute from him and the kings under his sway. These territories lied mostly in Himachal_Pradesh. From there Arjuna moved to territories in Punjab that were under the sway of the Trigarta tribe (see Arjuna in Trigarta) which lied mostly in Punjab. Arjuna continued his march towards north and reached the territories controlled by the Kambojas, like the kingdom of Kashmira, Kamboja, Darada, Loha and Rishika which lied mostly in Jammu and Kashmir (see Arjuna in Kamboja). Finally Arjuna reached Tibet traveling along the Sindhu river. Mbh.2.27:- Crossing the White mountains, Arjuna subjugated the country of the Kimpurushas ruled by Durmaputra, after a collision involving a great slaughter of Kshatriyas, and brought the region under his complete sway. After crossing the White mountains, Arjuna entered the the Kimpurusha territories that lied to its south along the Satadru (Sutluj) river. The Kimpurusha territories lied to the east of the Kinnara territories in (Kinnaur, Himachal Pradesh. This territory roughly corresponds to the Zanda_County in the Ngari_Prefecture of Tibet. Kinnaras were partially under the rule of king Bhagadatta, who was under the sway of the Yaksha king Kuvera ruling at Alaka. Kimpurusha territories were ruled by king Durmaputra (meaning the son of Druma). His father or preceptor was named Druma. He too is mentioned in Mahabharata as the ruler of the Kimpurushas. Kimpurusha territory too was under the sway of Yaksha king Kuvera (Kubera, Kuber). The capital of Durmaputra seems to be the Zanda-town (capital of Zanda-County) on the banks of Satadru (Sutluj). After defeating Kimpurusha king in battle Arjuna proceeded to the east along the Satadru river and entered the Guyhaka-Yaksha territories. Mbh.2.27:- Having reduced that country, he marched at the head of his troops to the country called Harataka, ruled by the Guhakas. Subjugating them by a policy of conciliation, the Kuru prince beheld in that region that excellent of lakes called Manasa and various other lakes and tanks sacred to the Rishis. Yaksha kingdom roughly comprises the Burang_County in the Ngari_Prefecture of Tibet. The lake Manasa and the mountain Kailasa are situated in Burang-County. The empire of Yaksha king Kuvera however included the Yaksha kingdom as well as the kingdoms of Kimpurushas and Kinnaras in the west. Many tribes of Gandharvas, Rakshasas, Kinnaras, Kimpurushas and Yakshas lived in Kuvera's empire as well as in his kingdom and capital city viz. Alaka or Alaka-puri. Alaka is assumed to be the Burang_Town that lied to the south of Kailasa mountain and Manasa lake in the valley of Sarayu river (Karnali_River). It is now the capital of Burang-County. It lies close to the junction of India-Nepal-China borders. The tribe of Yakshas were also known as Yakkha in Pali, Yaksa in Tai, Yasha in Japanese, Yecha or Yaocha in Chinese, Balu in Burmese and Gnod-sbin in Tibetan langueges. Yaksha king Kuvera was also known as Kubera, Kuber, Vaisravana, Vessavana, Jambhala and Zambala. Kubera seems to be a titular name used to denote the king of the Yakshas, like the name Indra used to denote the king of the Devas. Vaisravana seems to be an individual Yaksha king and the most famous among the Kubera kings. Vaisravana could mean the son of sage Visrava. The word Visravana could also mean the one who hear distinctly// or the one who is well heard or the one who is well known. Harataka was a kingdom ruled by the Guhyaka tribe. It was part of the Yaksha empire ruled by Kuvera (Kubera) the king of the Yakshas. In Mahabharata, Guhakas are mentioned as same as the Yakshas. They could as well be a sub-sect or tribe affiliated to the Yaksha tribe. The word Guha means cave or cave-like buildings. The Guhakas probably lived in buildings that contained under-ground rooms. The ancient 10th century western Tibetan kingdom named Guge (Guhyaka:- Guhyag:- Guge) seems to be a later re-emergence of the Guyhaka kingdom of Mahabharata-era. Arjuna is never mentioned as reaching the capital city of Kuvera, viz. Alaka. He seems to extract tribute from the Guyhaka tribes that lived in the western hinder-lands of the Yaksha territory by conciliation and diplomacy and not by war, as mentioned in the narration. He then went to the Manasa lake in the Yaksha territory. Arjuna could have engaged in a pact with Kuvera like he did with Bhagadatta of Pragjyotisha, probably supported by the recommendation of Bhagadatta himself. He might have achieved this through his messengers to Kuvera. Lake Manasa is the Manasarovar lake in Tibet, that lied to the south of Kailasa (Mount_Kailash) Manasarovar is the highest body of freshwater in the world. To the west of it was the lake of the Rakshasas (Lake_Rakshastal), which is not a fresh-water lake. The Rakshasas in the territory of king Kuvera lived around this lake. Mbh.2.27:- And the exalted prince having arrived at the lake Manasa conquered the regions ruled by the Gandharvas that lay around the Harataka territories. Here the conqueror took, as tribute from the country, numerous excellent horses called Tittiri, Kalmasha, Manduka. Having reached Manasa lake, Arjuna conquered the Gandharva territories adjacent to the Harataka territories. Mahabharata mentions about a Gandharva tribe living in the territory of Yaksha king Kuvera. Arjuna seems to reach this region. Gandharvas were allied to [[[mbh:Indra]], the king of Devas, as well. Hence it is likely that the Gandharva territories lied between the territories of the Yakshas and the Devas. 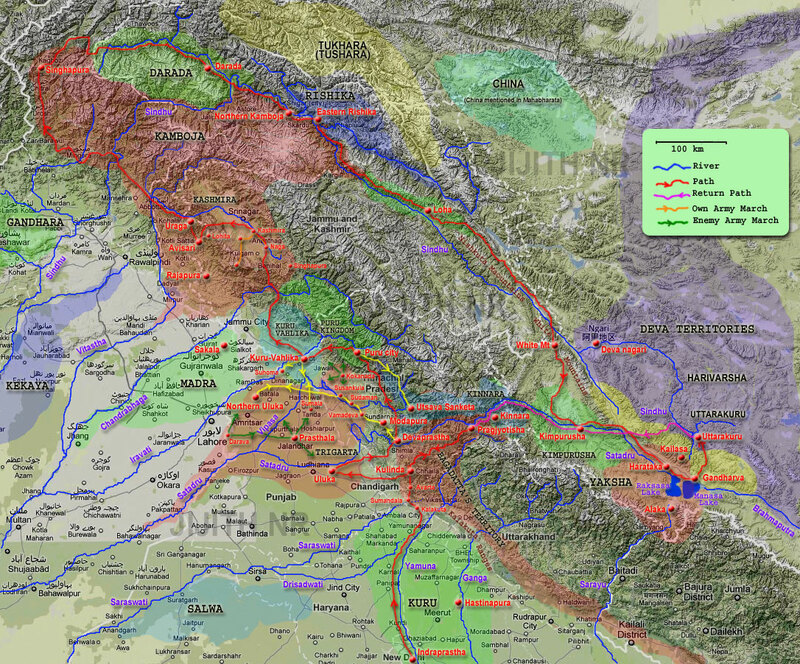 Gandharvas originally belonged to the hilly regions of western Gandhara along Afganistan-Pakistan border, especially in Kandahar. They later migrated to Sindhu (Indus), Saraswati and Satadru (Sutluj) rivers and finally reached Tibet by migrating along these rivers. During the Mahabharata era a large population of Gandharvas settled in and around the Yaksha territory. Some of these settlements were allied to Yaksha king Kuvera and others to Deva king Indra. The Gandharvas possessed horses of very good quality. Arjuna in another narration is mentioned as obtaining horses from a Gandharva named Angaraparna (also known as Chaitraratha the son of (Gandharva) Chitraratha). This Gandharva is mentioned as subordinate to Yaksha king Kuvera. Arjuna took from the Gandharvas the horses belonging to Tittiri, Kalmasha and Manduka breed as tribute. These territories seems to lie to the north of Manasa lake Manasarovara extending towards the Deva territories. The southern portions of the Gar_County in the Ngari_Prefecture of Tibet is a likely candidate of the Gandharva territory encountered by Arjuna. The name Gar seems to be derived from Gandharva. Arjuna's next destination was the Northern-Kuru territory that lied in the northern Harivarsha, a region belonging to the Deva territories. My assumption is that the Deva empire lied from Brahmaputra (Tsangpo) river in the south to the northern boarder of Tibet close to Kashmir. Some locate Indra's territories in the Pamirs or in Central Asia. However, this territory cannot be in the west or north of Kashmir since, in the cultures west and north-west of India, Indra is often depicted as a demon, where as in the east, in China, Japan, Burma and South East Asia, Indra is considered as a protector and a noble king of the Devas (ref: Indra in different cultures). The direction of East is often associated to Indra. In Buddhism Indra is mentioned as Sakra (the powerful), a name mentioned as a synonym of Indra in Mahabharata. Rig Veda too mentions Indra as Sakra and Vasava. In Chines Indra is called Dìshìtiān or as Shìtí Huányīn, in Burma as Thagyamin and in Japan as Taishakuten. This indicates that the Deva tribe of Indra migrated from the Sindhu-Saraswati regions into Tibet and settled in the southern and western regions of Tibet. The cultures that considered Indra as a protector later migrated eastward along Brahmaputra valley to reach Burma and South East Asia. Along Yangtze and Yellow rivers it spread to the rest of China and finally to Japan. The city of Indra viz. Amaravati or Deva-Nagari could be located on the banks of river Sindhu along which the Deva tribe migrated to Tibet. A possible candidate is Shiquanhe town also known as Ali, Ger and Ngari city on the banks of Sindhu. The name Ngari resembles the name Deva-Nagari, meaning the city of the Devas. The script named Devanagari for writing Sanskrit could be originated from a city of the Devas. Another city named Gegyai also lies on Sindhu to the east. There is a famous pre-historic cultural site near the town of Rutog to the north of Ali. This is another candidate location. Mbh.2.27:- At last Arjuna, arriving in the country of North Harivarsha desired to conquer it. Thereupon certain frontier-guards of huge bodies and endued with great strength and energy, coming to him with gallant hearts, said, O son of Pritha, this country can be never conquered by thee. The Northern Kurus live here. There cannot be war here. Even if thou enterest it, thou will not be able to behold anything, for with human eyes nothing can be seen here. If your land is shut against human beings, I shall not enter it. Let something be paid unto Yudhishthira by ye as tribute. Hearing these words of Arjuna, they gave him as tribute many cloths and ornaments of celestial make, silks of celestial texture and skins of celestial origin. After defeating the Gandharvas Arjuna at last reached the Northern Harivarsha. In Vishnu Purana, Harivarsha is mentioned as north of Kimpurusha Varsha which included Lake Manasa. This would make Harivarsha, to lie towards the north of the territories of Kimpurushas and Yakshas as per Mahabharata. This territory would then lie along the Sindhu (Indus) river in Tibet, while Kimpurusha Varsha lied along the Satadru (Sutluj) river. The rivers are important since they served as the migratory paths for these tribes. The migration probably occurred towards the end of the last Ice Age, from the southern course of Saraswati and Sindhu. The tribute obtained from Uttarakuru includes silk (cloths and ornaments of celestial make, silks of celestial texture and skins of celestial origin). This indicate that the location of Uttarakuru is to be in Chines territory. In the narration, Harivarsha is mentioned as equal to or containing the territory of the northern-Kurus (otherwise known as the Uttarakuru territory). This territory seems to be related to the Kuru tribe, a northern branch of the Kurus and possibly the oldest branch of the Kurus. As per Mahabharata, Pururavas an ancestral king of the Puru-Bharata-Kuru tribe ruled in this territory, amongst the company of the Gandharvas. The Brahmanda Purana and Vayu Purana state that the Pururavas, the ancestors of the Puru race once lived with his wife Apsara-Urvasi in Uttarakuru. Aitareya Brahmana mentions that Uttarakuru was a territory or province of the Devas (deva-ksetra). Thus the Harivarsha, with Uttarakuru belonged to the Deva territories or the empire of the Devas. Uttarakuru territory existed during Buddhist era as well. Ptolemy's Geography refers to Ottorokorai (Uttarakuru) tribe, Ottorokora as a city, and Ottorokoras as a river. Ammianus Marcellinus refers to Uttarakuru as Ottorogorae. Some Buddhist texts mentions that the king of Uttarakuru was Kuvera. It is a country often mentioned in the Nikāyas and in later Buddhist literature. A detailed description of it is given in the ātānātiya Sutta. In this Uttarakuru is spoken of as a city. Alakamanda is mentioned as the main city of Kuvera, which seems to be Alaka, the capital of Kuvera. Thus these texts either equates or mistakes Uttarakuru to be the Yaksha-territory ruled by Kuvera himself. Thus there is a possibility that Uttara-Kuru is same as the Yaksha territory ruled by Kuvera. It is likely that during Mahabharata era, Uttarakuru and the kingdom of Kuvera were separate and during the Buddhist era they merged. Considering all these, Uttarakuru could be a territory that lied close to the Yaksha territory, with some overlaps with this territory. Hence, one candidate location of Uttarakuru is the regions around the Sindhu (Indus) river close to its source to the north of Kailasa. Thus it would be adjacent to the Yaksha territories to be influenced by the Yakshas and yet lie in the northern Harivarsha province belonging to the Deva territories to the north of the main Yaksha-territories. Guge Kingdom :- Guhyaka kingdom?